What? It’s that time already? I hate seeing Christmas decor popping up before fall in all of the big box stores but if you mass produce Christmas cards now is the time to get stamping! I have a simple quick card that would be fabulous to create for all of those special people on your list! The Stampin’ Up supply list is short and that’s important when you are making lots of cards. I used a very traditional color palette of real red, cucumber crush, garden green and whisper white. 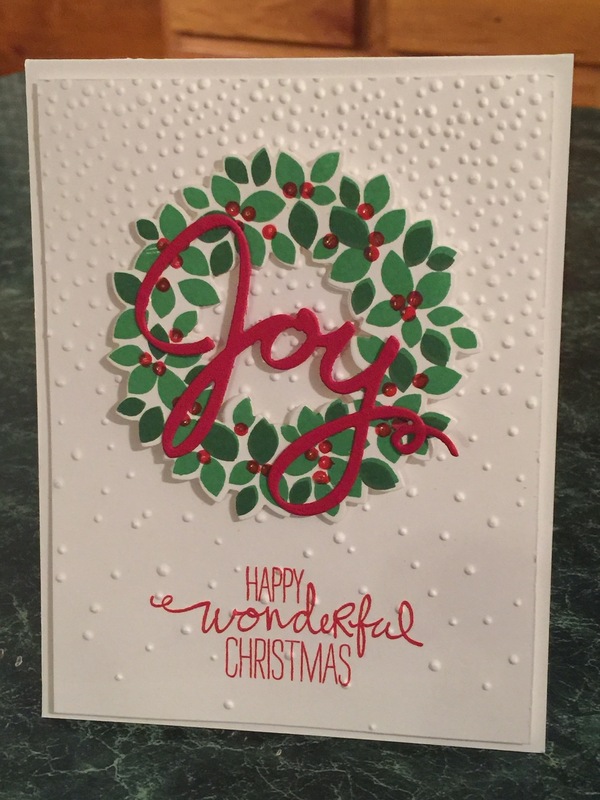 I used the wondrous wreath stamp set from the annual catalog along with the matching thinlets. I adore the softly falling embossing folder. It adds a dusting of elegant texture to a simple card. Hope you enjoy today’s creation. It’s been really hard to find time to blog after getting 5 kids back to school this week and working too! I know lots of families are struggling with this right now so quick and simple is what fits the bill during times like this right? Soon things will settle down but till next time…just keep stamping! Dropping In To Say Hi!!!!! It seems like summer is coming to a screeching halt. It’s time to prepare for the upcoming school year and I’m kicking and screaming “I don’t want it to end” right along with my children. Anyone else there with me? I’m not ready for the lazy lake days to come to an end. I haven’t got in as many as I would like to this year anyway. I took a few minutes last week to sit down at my desk and create this card for a friend I needed to catch up with. I love all the new items in the catalog but always try to showcase something old, something new and something blue! Just kidding! I do try to show the ladies how to use something they probably already have along with something new. I don’t know about you but I can’t afford to buy everything new I see demoed no matter how much I think I need it. Sometimes I like to learn a new way to use something I already have so here goes….. I used the Wondrous Wreath stamp set by Stampin’ Up to create this charming garden feel card. I love the brick wall embossing folder. It gives this card such a cottage vibe. It’s almost as if I’m sitting at a cute wicker table in someones quaint little garden having a cup of tea and chatting while making sure I keep my pinkie up. I used a simple color palette of Dapper Denim, Old Olive and Wild Wasabi inks along with Rose Red, Crumb Cake and Whisper White card stock. I used the circle framelits to make the frame and the Wonderful Wreath framelit dies to cut out the wreath and bow.I finished off the front of this card with a sentiment from the fabulous Acorny Thank You stamp set. I stamped the label in the lovely Dapper Denim and then punched it with the Decorative Label Punch. A few Pearl Basic Jewels and this card is ready to pop in the mail!!!! I need to run by the post office so I’ll see you soon.